Coconut Consumer Questionnaire – We want to hear from you! Following the passage of Hurricane Maria, reports from on the ground indicated that agriculture was totally destroyed. The Caribbean Disaster Emergency Management Agency (CDEMA) led CARICOM’s response and reported severe damage to farm housing, irrigation, infrastructure, feeder roads, forest reserves, coastal fisheries and widespread loss of poultry. For Dominica, this was significant since at least 25% of the population directly depend on agriculture for their livelihoods. The agriculture sector sustained significant damage from both hurricanes Maria and Irma. 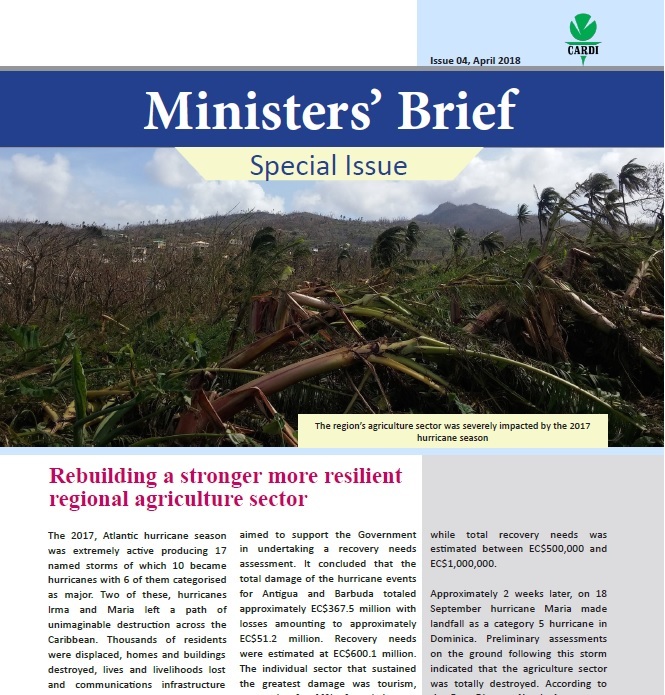 The Departments of Agriculture in St. Kitts and Nevis conducted rapid assessments of the damage and the information gleaned was used to focus relief efforts under the IICA/CARDI Technical Cooperation framework. One of the areas of focus was the provision of seeds and seedlings to farmers. Over a three month period starting in December 2017 farmers received seedlings for a range of vegetables. This phased approach prevented over supply and resulting gluts on the market.